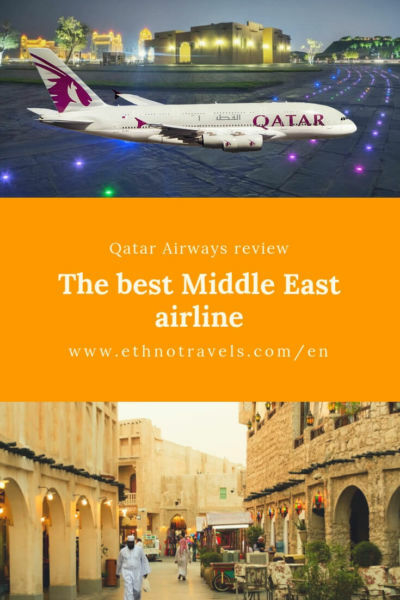 In this article “Qatar Airways review”, I share with you my experience of Qatar Airways, which I use for each of my trips to Asia, and which for me is the best Middle East airline. You should read this article if you are wondering if you should travel with Qatar Airways on your next trip, if you are looking for the best airline for flights from Europe to Asia, the Near and Middle East or Oceania or if you are looking for the company with the best value for money. You are soon leaving for Asia, the Near or Middle East, Oceania and you are wondering which airline to use? You have heard about Qatar Airways but you are wondering if its low prices equate to poor service? Are you hesitating between Emirates, Oman Air and Qatar Airways? During my first independent trip to Asia in 2007, I flew with Qatar Airways. Since then, I have been travelling systematically with them, except for my last 3-month trip, for which I wanted to test the difference with Oman Air. So I flew 52 times with Qatar Airways (13 round trips to Asia), either in economy class or business class following numerous upgrades (I explain how further). 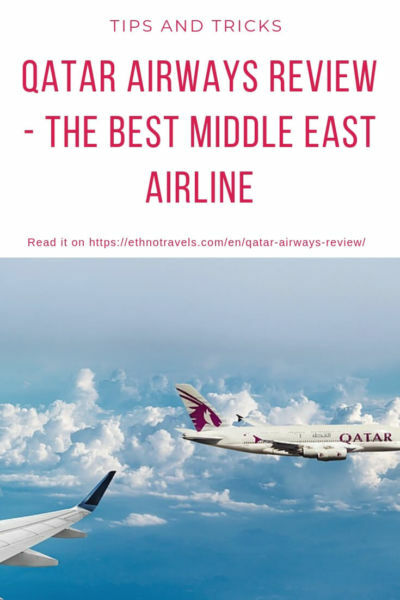 In my opinion, Qatar is the best Middle East airline and I explain why in this article. I will tell you about my experience in both Business Class and Economy Class, but also about the latest innovations in terms of comfort such as the QSuite. I will explain the customer journey, from booking to after-sales service and give you tips, including the Privilege Club loyalty programme and how to buy your ticket. The company offers flights and promotions from the capital cities but also from a few main cities in each country as Nice in France, but you can leave from a provincial airport, or even from a train station, with an end-to-end ticket purchased from Qatar. Click here to see the latest prices and availability for your trip. Qatar Airways booking: where to buy and at which price? At what price to buy your flight ticket? Where to buy your flight ticket? Qatar Airways 2 for 1 offer. Check-in procedure, choice of seats and boarding. How is the classic check-in on Qatar Airways flights going? Can you choose your seat on Qatar Airways flights? Baggage allowance on Qatar Airways flights. Qatar Airways checked baggage allowance. Qatar Airways hand bagage allowance. Qatar Airways business class review. Qatar Airways Business Class : the best business class in the world. 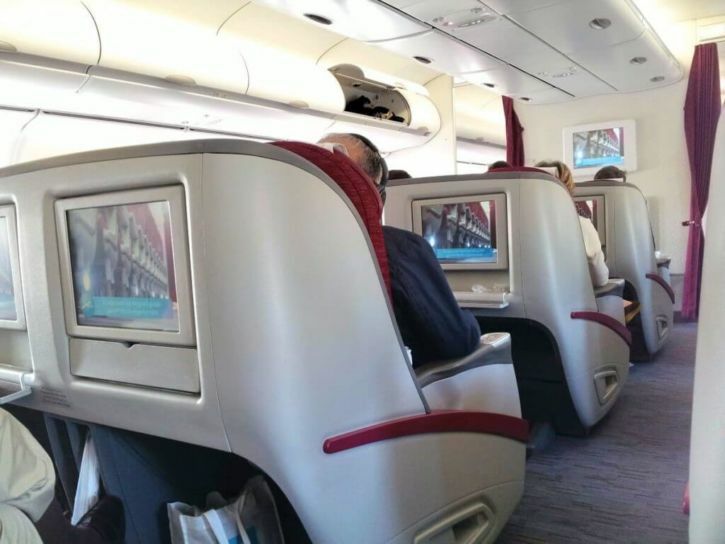 My experience of Qatar Airways’ Business Class. Business Class Qatar Airways comfort. Qatar Airways first class review. 2017 and 2018 Qatar Airways awards. My experience in Qatar Airways’ economy class. The Qatar Airways aircraft fleet. Qatar Airways a380 business class. Qatar Airways A380 economy class. Qatar Airways A380 First Class. Cabin plan a380 Qatar Airways. Boeing 787 Dreamliner Qatar Airways. Boeing 777 Qatar Airways review. Business Class Qatar Airways 777. Privilege Club: Qatar Airways loyalty program. Reclamation service, ticket modification and assistance in a disrupted situation. Is it better to travel with Oman Air, Emirates or Qatar Airways? Conclusion : why I recommend Qatar Airways to you. I have a few techniques for paying my plane ticket cheaper. When I go to Asia for 3/4 weeks, I rarely bother to compare the promotional offers of airlines because I noticed that Qatar Airways is always cheaper. On the other hand, I always try to leave outside of school holidays and festivals and I always do a search with flexible dates. I have also often let Qatar choose my destination by buying the cheapest ticket of the moment. I was thus able to return to China for the 2nd time with a flight at 360€ incl. VAT round trip. My first round trip flight to India cost me only €333 including tax. A season employee I advised was able to go to Indonesia for less than 400€ round trip (302€ from Paris to Bangkok with Qatar Airways and then a Bangkok Denpasar with Air Asia). For more expensive or more difficult to access destinations such as Bali (previous example) or Sulawesi Island, just get a good price on the return trip to Bangkok or Kuala Lumpur, the two main Asian airports, and book a low cost flight to your final destination. You will often save several hundred euros! Please read the exchange and refund conditions, clearly mentioned on the website for each of the proposed rates. Sometimes, for just a few more euros, you can benefit from more flexible exchange and refund conditions. I always make my reservations online on the Qatar Airways website, which allows me to search for the most interesting dates in relation to my destination. By using the link above, you allow me to continue to give you the best advice, thanks to the commission paid by Qatar Airways, at no extra cost to you. You can also order your ticket from Qatar Airways Customer Service. It will cost you 30€ more per passenger. The staff is very helpful, competent and generally has access to the same prices as online – but sometimes there are specific promotions or offers when booking online. If you choose to book by phone, I advise you to do your own research on the Qatar website before your call. This will give you a clear idea of the price you can get on the dates you are interested in. When writing this article, I tried to contact customer service and I had to be very, very patient. I also had a lot of trouble finding the right phone number because it was not accessible on their site due to a computer bug. The advantage of being part of the loyalty program is that I was also able to call the dedicated number. I very quickly obtained an operator who gave me a lot of information! If you live in a capital city, you can go to the Qatar office and book your tickets there. As with booking by phone, it will cost you an additional €30 per passenger. The 2 for 1 or Duo offer is regularly offered by the company, whether in economy or business class, on the basis of two tickets purchased. The company offers the possibility of visiting several places with the same round trip ticket. All you have to do is activate the multi-destination option when you search for flights. You can reach Qatar Airways in French or English at: 0033 1 43 12 84 40, Monday to Saturday from 9am to 6pm and Sunday from 10am to 6pm. Staff are of course available at Roissy Charles de Gaulle airport. However, it does not manage reservations and after-sales services. Please note that the numbers in the information pages are incorrect. The Privilege Club members’ call centre is open Monday to Saturday from 9am to 6pm, and Sunday from 10am to 6pm. Online check-in, usually open 48 hours before flight time, allows you to choose your seat for free if you have not already done so when you book and to print your boarding pass. Once at the airport, all you have to do is drop off your luggage at the quick drop-off points. You do not need to queue at the check-in counters and can arrive later. A number of airports, including Roissy Charles de Gaulle, offer the possibility of checking in from your mobile phone. There is a Qatar Airways app. A QR code will be downloaded to your device and can be scanned at the airport. As with online check-in, you will only have to go to the baggage counters once at the airport. If you prefer to check in in the traditional way, check-in is open from 3 hours to 1 hour before the flight. In this case, you will have to go to the check-in counters dedicated to your flight, stand in line, present your passport and make a reservation. In exchange, you will receive your boarding pass and your luggage will be checked in. There are counters dedicated to Business and First Class customers. Privilege Club members, starting at the Silver level (equivalent to about two round trips from Europe to Asia over a year), have priority and are also registered at the Business counters. You will find all the benefits for Privilege Club members in the dedicated section. When booking online, you are offered to choose your seat for free. You have access to the aircraft map and can therefore choose easily. If you did not choose your seat when booking, you can do so again when you check in. You will have to pass through customs and police controls before entering the boarding area. Once again, passengers from Business, First, Privilege Club, people with disabilities and families with young children are given priority. It is when you give your boarding pass that you will know whether or not you enjoy being upgraded. This has happened to me very often and at least on one flight per trip (two on the round trip) in recent years, thanks to my Privilege Club membership. There is a free baggage allowance for checked baggage, which varies according to the travel class (First and Business customers can carry more weight than Eco customers) and the journey. You will be informed of this deductible at the time of your reservation but to simplify you can have a maximum of 23 kilos transported free of charge. Privilege Club members are entitled to an additional allowance, depending on their level. In addition to the baggage carried free of charge in the cargo hold, there is a hand baggage allowance. For First and Business customers, this includes two pieces of luggage for a total weight of 15 kilos. For economy class customers, it is a baggage of 7kgs maximum. Trip Advisor also awarded it in 2018 through its Travelers’ Choice. Thanks to my Privilege Club membership and my regular feedback, I have had the opportunity to travel very often in Business Class with Qatar Airways. The service and comfort are extraordinary. On my 52 flights with Qatar Airways, I must have been upgraded on almost half of them! This gives me the opportunity to share my experience with you in full knowledge of the facts. Business Class meals are served in beautiful luxury porcelain dishes. These are not meal platters, since each dish is brought one after the other. In fact, it’s exactly as if you were in a restaurant: you are given a nice card on glossy paper and you choose your dishes and drinks and then the dishes are brought to you one after the other. All dishes are designed by top chefs. You can even match your wine to each dish. These are of course fine wines. Non-alcoholic fruit juices and cocktails are made with fresh fruit squeezed on demand. Belgian Godiva chocolates, fine pastries are offered to you. You can eat at any time and as much as you want. On my first trip, I was first offered champagne. Then I ate foie gras and caviar. In short, it’s classy and absolutely perfect! The large armchair turns into a bed and you sleep perfectly. Qatar’s business seat was voted the best in the world by Skytrax in 2018. The workspace is well suited for professionals. Many elements are made of walnut burl. The dining table is large and practical. The TV screen is very large. The storage space is spacious. The company is constantly innovating to offer the latest improvements in terms of comfort to its business passengers, as you will see in the section on the Q Suite below. A toilet bag with luxury products is offered to you, as are those available in the toilets. You also have a nightwear and designer slippers, a thick and comfortable duvet. The QSuite is Qatar Airways’ latest innovation in terms of comfort for business customers. As its name suggests, it is a private suite, adaptable for 2 or 4 people, with a real double bed. I invite you to look at the description and photos directly on the website. The QSuite is very much in demand by Business Class customers, who are very demanding in terms of innovation. It is available on the A350 and some Boeing777s. Qatar qualifies it as First in Business Class. Click here to book your Business ticket. Unfortunately, I have never tested Qatar Airways’ First Class. However, I invite you to look at the pictures of this comprehensive review, that will give you an excellent idea of the luxury of First Class. I must admit that after consulting it, I only dream of one thing: being invited by the company to test it, taking a ton of photos and writing you the same type of article to share my experience with you! As you will see, Qatar First Class is even more spacious than the QSuite. It also has an absolutely incredible lounge, a gigantic toilet. Every detail is extremely refined. I didn’t think we could offer even better service and comfort than Qatar Airways Business Class, well, it’s possible! In short, I fell in love with Qatar Airways First Class just by looking at the pictures! First Qatar Airways lounge was voted the best in the world by Skytrax in 2018. Click here to book your First Class ticket. In 2017, Qatar Airways received more than 50 prestigious awards, including the distinction of being the world’s best airline by Skytrax – for the 7th consecutive time. In 2018, the title was taken away by Singapore Airlines, despite being named the best airline in the Middle East by various panels, such as Money Magazine. Apex (Airline Passenger Experience Association) awarded it the title of best seat comfort, best cabin crew, best drink and meal and best in general for the Middle East. Qatar Airways’ economy class meal tray is the best of all the companies I have tested (Air France, Oman Air, Jet Airways, China Airlines, Indigo, Air Asia, etc.). It is extremely copious and varied. Meals and snacks are served very – to much – often. Beverages, including alcohol, are served as desired. Be careful, however, with the Ramadan period for alcohol. Seats are generally more comfortable and spacious than with other airlines. The aircraft are very clean, including the toilets, which are regularly cleaned during the flight. The staff is very attentive and the service is excellent. Having worked in the field of customer relations for 20 years, I have nevertheless noticed that there may be slight differences in the little extras and the personalisation of the relationship according to the crews. Nevertheless, the service is always at its best. Depending on the flight, a night kit is available. Qatar Airways makes no price distinction between economy class customers. Whether you have paid a nominal price or the maximum price, the service will be exactly the same, unlike most other companies that make a difference through a premium offer. Be careful if you use the A319 (there are only 2): there is no TV screen. Click here to book your economy-class ticket. Qatar Airways’ Airbus 380 has two floors. The main deck has 405 economy class seats and a high ceiling. The upper deck has 56 eco-class seats, 48 Business Class seats, 8 First Class seats and the lounge. Configured in 1-2-1, it allows direct access to the corridor from all seats. The seat can be transformed into a perfectly flat 203cm bed. It has a width of 56 cm, 76 cm in bed position. The screen is 43cm wide. The seats offer more legroom, a wider angle of inclination and profiled head rests. Arranged in 3-4-3 as main deck; 2-4-2 as upper deck. The central seats measure from 43 to 47cm. The screen is 27cm wide. Arranged in 1-2-1, the seats measure 58cm and 84cm in bed position. The screens are 66cm long. You can find the plans on Qatar’s website. The dimensions are the same as for A380. * 787 Dreamliner includes only one bridge and no First Class. * The windows are bigger. * The economy class TV screen is larger (31cm vs. 27cm). * A different pressure for more comfort. * A less polluting and noiseless aircraft. Equivalent to the Airbus A380 but on a single floor, Airbus A350 allows you to travel in QSuite. Configured as 2-2-2 with extra-wide massage seats that recline 180° to be perfectly flat, some of the 777’s business classes offer the QSuite. Boeing 777’s economy class offers less legroom than Airbus A380 and A350. Apart from A319, all Qatar Airways aircraft are equipped with individual TV screens, with a wide choice of recent films in several languages, games, TV shows, music, documentaries. A headset is provided free of charge. Games can be lent for children. Some flights offer WIFI (paid option). Some aircraft have a lounge for First Class and Business customers. Qatar Airways offers flights from Paris Charles de Gaulle and Nice, but also special fares from certain airports and provincial stations. All flights are with change in Doha, the capital of Qatar. The company serves more than 150 destinations around the world. Flights to the Near and Middle East, Asia and Oceania are particularly interesting. Joining Privilege Club, Qatar Airways’ loyalty program, is completely free. It allows you to earn Qmiles for each flight, which can be exchanged for free tickets. To give you an idea, I was able to get a free round trip to Asia after 5 round trips, knowing that I waited until I had enough points to choose one of the most expensive destinations (whether in Euros or Qmiles). Each trip also allows you to earn Qpoints, which determine your level in the loyalty program (Burgundy, Silver, Gold, Platinum). * Be able to earn Qmiles by booking with partners (e.g. Agoda for hotels in Asia). * Priority in case of a waiting list, which in my case has resulted in many upgrades (the non-Privilege Club customer gets my place and I travel in Business for the same price). * Use of Qmiles for purchases at the airport. * A dedicated telephone line. * Customization of customer relations on certain flights. * Access to the lounges. The best! Not only can you rest, take a shower during the stopover in Doha, use computers and printers, but you can also eat delicious dishes such as oriental pastries and hummus in Doha, drink champagne or anything else, all for free. * Check-in at Business counters. For any complaint or suggestion, do not hesitate to write to customer service. They respond SYSTEMATICALLY and are very concerned about the quality of their service. Thanks to the combination of Privilege Club member/customer providing suggestions for service improvement, I am regularly upgraded. As a customer relations specialist myself, I know that Qatar Airways appreciates constructive feedback to improve its service and get feedback. The company is especially receptive to suggestions and comments from Business, First or Privilege Club customers. Paris’ central reservation office can make your exchanges and refunds, depending on the conditions mentioned when you purchased your ticket (they are indicated on your reservation confirmation). In the case of a disrupted situation attributable to Qatar Airways, the company takes care of the exchange of your flights and provides meals and accommodation if necessary. As you will see in the next section, Qatar Airways is consistently winning more professional awards than Emirates and Oman Air. At the beginning of 2018, however, I tested Oman Air because I was going to India for 3 months and Qatar was not competitive in terms of price. Although Oman Air’s service is very good, I couldn’t help but compare it systematically with Qatar. In particular, I found the seats less comfortable – although I had paid extra to get more legroom. During the first stopover, I found the waiting conditions deplorable. The airport seemed very old, uncomfortable, extremely dirty and noisy to me. The toilets were in a terrible condition. This was not the case on the way back, since I was in another part of the airport, more modern and pleasant. The meal trays were less copious and very average. The staff did not give me an unforgettable memory. On the other hand, the price was unbeatable! Qatar Airways was preceded for the first time this year by Singapore Airlines. * Best seat in Business class. * Food in the lounges. * In-flight catering in Business class. * Business Class Comfort Kit. * Best business class lounge. * Best catering in its lounges. * the excellence of its service. * excellent on-board comfort in all classes. * its loyalty program, which allows you to be upgraded and have access to many advantages. Have you ever travelled with Qatar Airways? Let us know what you think! If this article has been useful to you, don’t forget to share it on social networks! Read also my advice section for independent travellers.